The game isn’t the easiest for even the most experienced of hunters. This particular game bird is very good at getting away. With extremely good hearing and even better eyesight, the turkey can be the bane of even the best hunters. While it won’t guarantee a bagged bird, dressing for success is a vital part of the game. There are two things to keep in mind when dressing for the game. These are camouflage and safety. The safety factor should be the biggest concern, but camouflage is very important when the game is the planned attraction. Pants and jacket: Camouflage should be included in both the top and bottom of a hunter’s outfit. It is important that as much of the skin be covered. Do take care to adjust the weights of camouflage for the weather. Movement to take off a jacket, for example, could easily give away a hunter’s position to a flock of birds. Gloves: Many hunters try to cover their hands, as well. Partial gloves at the least can help hide the flesh tones and also might assist with getting the job done, especially if bow hunting is the plan. Hat: Covering the hair can be important for the hunter. This is especially so with hair coloring that greatly contrasts with the surroundings. Boots: Whether these are camouflage or just colored well enough to blend in, proper foot gear is important. 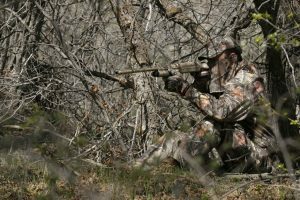 When picking out the right camouflage gear for your hunt, make sure it matches the surroundings correctly. Green camouflage, for example, fits in very well in some locations, especially in the spring. Fall hunting might need browner toned camouflage. Consider the surroundings before picking out gear and you will be rewarded with your stealth ninja skills. The turkey hunting game can be very serious business. With this in mind, dressing for safety is also important. It is very wise to avoid red, white or blue in clothing as these are the colors of a gobbler’s head. Another hunter might mistake these colors in clothing. Avoid tragedy by avoiding these colors. The items of clothes where this could be a problem include socks and even underwear. The game won’t be won on clothes alone. They can give an edge though. When the combination includes camouflage and the right choices for safety, it’s a winner.